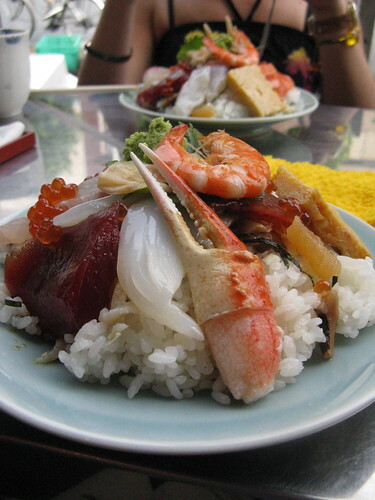 Posted by ayasawada in Japan, Personal, Travel. As mentioned a few weeks ago I was soon to take my third trip to Japan. Well those two weeks came and went in a flash, and boy what a time I had. It was fantastic and probably the best holiday I’ve ever had. Not only did I do almost every single thing I would ever have wanted to do on a trip to Japan (which is as exhausting as it sounds), but I got to share it with my friends who share my Japanophilia. For me that’s what really made this trip special. I went with friends with whom I had began Japanese lessons all those years ago, as well as friends met through various London conversation clubs. On top of that there was the happy coincidence of several others having either just moved out to Japan or travelling at the same time. And we had many old friends and sensei to visit, with plenty of new friends made too. You can see all the photos from the trip over on Flickr. We stuck our plan pretty well. We had a day in Tokyo to lie-in and get over the jetlag (though to be perfectly honest I couldn’t sleep at all and my jetlag persisted for pretty much the whole trip. Still, three hours sleep a night adds to that dreamy experience I have whenever I go to Japan ^^). 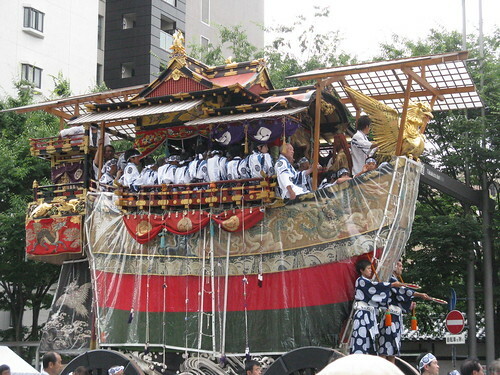 From Osaka it was just 30 minutes to Kyoto for the Gion Matsuri. The actual parade was a little disappointing. While there were a lot of floats, many of them looked the same and the whole two hour event had the same slightly dreary shrine music playing throughout. I guess I was expecting more of a carnival thing with big extravagant floats and lots of noise. More enjoyable was the general festival atmosphere around Kyoto, a city I always like revisiting, if only for nostalgia. We had a nice walk around the temples and backstreets of Gion, despite a rather sudden downpour of rain. We then travelled to Shikoku for a few days. 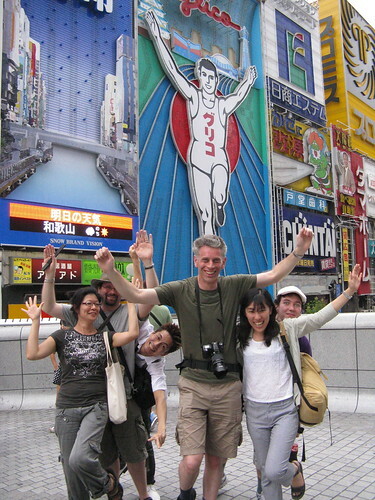 We took an enjoyable coach trip from Osaka, via Kobe and the Asahi-Kaikyo Bridge (one of the longest in the world). Though we didn’t spend long in Shikoku, it was enough of a taster to peer out the windows and see bits of the rural towns before arriving several hours later in sleepy Imabari, where our ryokan was based. Imabari was a nice, if slightly saddening town. A harbour town we were told it was apparently quite bustling until recently when the government changed shipping laws, preventing ships over a certain side from coming inland enough to dock at Imabari. Thus a busy town became a ghost town as many people moved away to find work. To walk along Imabari’s shopping arcades, with half the shops closed and the others with few (if any) customers, is a slightly depressing experience. 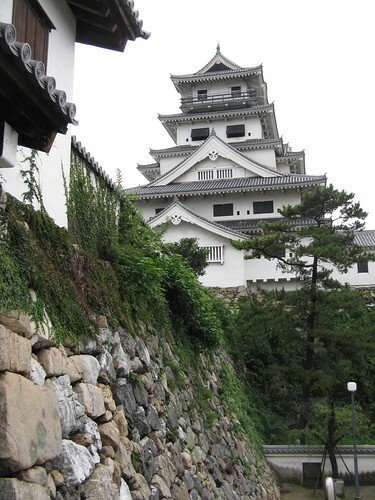 It’s a charming town though, with a nice (though not historical) castle, some good izakaya and fond memories for me. Our main purpose for going to Shikoku was a daytrip to Matsuyama, the capital of the island and home to a famous castle and Japan’s oldest bathhouse, Dogo Onsen. The castle didn’t disappoint, particularly with its high vantage point offering spectacular views of the city (although the hike up on a hot summer day almost finished us off). 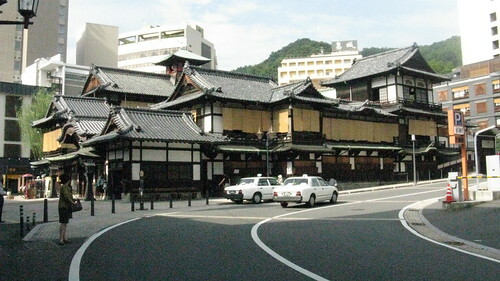 The onsen was similarly spectacular in terms of its architecture, right out of Miyazaki’s Sen to Chihiro no Kamikakushi. The actual onsen itself though was a little disappointing, a typical bath no different from the many ofuro I’d experienced previously, though the water was obviously better :p. I guess what I really wanted was more of an ‘onsen resort’ experience with an outdoor bath and scenery, and for that I’ll have to go somewhere like Hakone next time. We took the train and Shinkansen back to Kansai via Okayama and the Seto-Chūō Bridge, with some gorgeous views of Shikoku and the surrounding islands on a sunny day. After an overnight back in Osaka, it was back to Tokyo to meet up with more friends, hang out in Shibuya and do the otaku thing (more on that in a separate post). We, surprisingly, even woke up early to visit the Tsukiji fish market, consistently rated one of the best things to see in Japan. It was indeed grand, although completely mad. You take your life into your own hands going to that place, with people rushing around and small gas-powered karts zooming back and forth through impossible gaps. And all that while you’re not exactly awake at 6am. Nevertheless, the noise, colour and smell of the place is incredible, and nothing beats a fresh sashimi breakfast at 8 in the morning ^^. 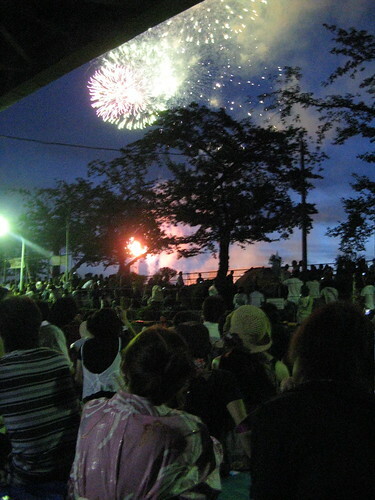 That same day (somewhat ambitiously) was meant to be the big finish for us at the Sumidagawa Hanabi, one of the most famous summer fireworks displays in Japan. We did make it, and the fireworks themselves were an incredible two hour spectacular, but I can’t say I enjoyed the experience a whole lot. This was mainly due to the excessive crowds on what was already a hot day. I’d also somewhat overambitiously planned to meet 15 other people for the event, a number that kept growing with various friends of friends, and made worse when (as I should have expected) no-one managed to turn up on time. It is not fun rushing back and forth trying to coordinate a big group of people, in an area already rammed. While the fireworks itself were spectacular, I would heartily advise going in a very small group and (if you can handle the sun) even going 5-6 hours beforehand to reserve a spot. Many people put down plastic mats and even tables marked with their names the night before — some in streets miles away from the riverbank — and it seems people in Japan respect that and don’t steal your spot. Tensions aside (and those largely due to my own over-ambitious planning), it was a wonderful wonderful trip. For the first time I arrived in Japan feeling comfortable. Despite my constant jetlag, the country didn’t feel as overwhelming as it had on my previous two trips. I guess it was familiarity, with the routes, signs, customs, everything. And after almost five years studying Nihongo, I finally felt confident enough to ask directions, questions, and understand (most of) what people were saying back to me. Yet Japan still feels like a dream to me. Perhaps it’s the constant jetlag, or the time-difference, or the complete difference in culture compared to the UK (even when it’s all familiar). It still feels like wandering through my imagination, through that place in my head that I retreat to in my free-time, full of all the things I love. I really couldn’t have wished for more, and, because I shared it with so many friends this time, I doubt I’ll ever get such an experience again. To share what you love with people you love, who it just as much as you do, that’s all anyone can ask for, on a holiday or otherwise.